I have written about my foraging and eating wildly grown food experiences here. No point repeating the same but with broken heart I am watching that with the rapidly growing urbanisation and increasing use of pesticides foraging in India is dying a slow death. Also in India foraging is something associated with people with lesser fortunes. The general notion is people who find it difficult to meet the both ends meet go for foraging and well off people do not eat those indigenous greens. I also see a lot of wild greens growing profusely around where I live in Kolkata but I know most probably they are seasoned with Dog .... and sewerage water. I for myself dont feel like eating them and rather watch the maids picking them on their way home from work. The same greens are available in my local market where I eagerly buy them with a pestering thought at the back of my mind, whether they are gatherd from similar places. But then I reason that when I cant see there is no point thinking about it. Even the cultivated ones are sprayed with so much pesticide and God only knows how they are grown. If the newspaper reports are to be believed they might as well be inedible by now. The situation is same in the country sides as well. The air in my in Laws village some 200 KMs away from Kolkata is heavy with the smell of pesticides, abundantly used in the paddy fields. Hingche, Gime, Thankuni, Bothua grows along the fields but probably not edible any more. 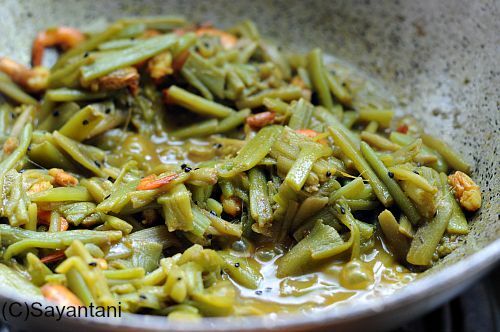 As promised here is the Shapla Chingrir ghanto recipe shared by my Vegetable Vendor from the market. His recipe was pure vegetarian only with a tempering and mustard paste. from my previous experience with Kochur Loti (taro stolons) which looked very similar to the stems of the shapla, I asked if I could use shrimps. 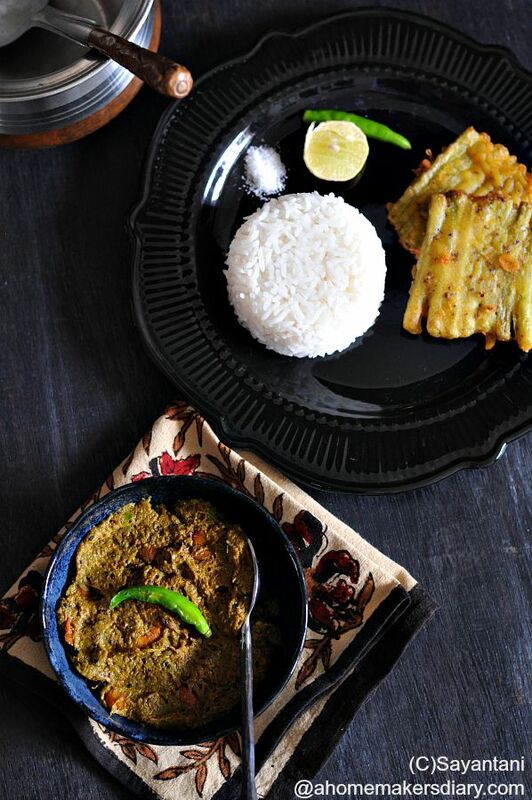 To which he smiled and said 'Chingri dile to sob kichui bhalo lage' Everything tastes good with shrimps. His wife told me in their native places they would gather shapla from the shallow waters along with tiny shrimps from the paddy fields to make this. But in Kolkata even shrimps are Rs.350 kg and they cant afford it here. Luckily for me I had a handful of tiny shrimps in the freezer and my 6 years old eats everything with shrimps in it. And the taste was so awesome that I can see this recipe being made in my kitchen every season year after year. The recipe itself is very straight forward, requires very few pantry staples and comes together in 20 minutes. 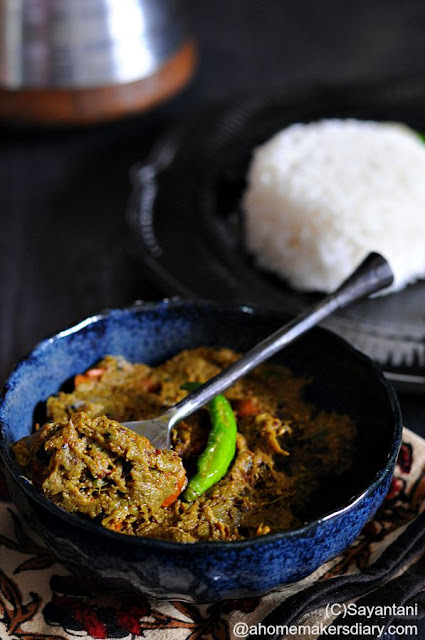 Use mustard paste for best flavour or mix at least a tsp of mustard oil to bring out the taste, texture and flavour of mustard paste used in the recipe. Wash the stems thoroughly and Prepare the stems as mentioned in the previous post and cut in 1" pieces. Wash again and let it drain for at least 15 minutes in a sieve. With a pinch of salt pound 3 chilies or grind them with the mustard. Keep aside. Wash, clean and chop the shrimps in small pieces. Sprinkle salt and turmeric and keep aside. Heat oil in a kadhai or wok. Once the oil is smoking add the nigella seeds and 2 green chilies slited lengthwise. Let it release its aroma and splutter. I have seen that if you let the seeds brown almost on the verge of dark the aroma is much heady and better. But make sure they are not burnt or you will end up with a bitter tasting curry. Now add the shrimp pieces and saute for a minute followed by the drained stems. Add turmeric, salt and stir it. Lots of water will be released so keep cooking it on medium high flame for 10 minutes or till the juice is almost dry. Stir from time to time and cook covered. When there is no visible water in the pan and the stems turn into a mush then add the mustard paste and the pounded chilies (if using separately). Mix thoroughly and keep mixing and cooking on a medium flame for another 5-8 minutes or till the mush starts leaving the sides of the pan. This should look glossy now with oil oozing out. Adjust the seasoning by adding sugar, salt or chilies. We like it on a hotter side and sometimes if the green chilies are not hot add red chili powder as well. use a handful of soaked kalachana or balck chickpeas. After tempering the oil with chilies and nigella seeds add the kalachana and salt. saute for a minute followed by the stems. When you add the mustard paste add 1/2 cup freshly scraped coconut and cook along with the mustard. Just before taking off from the fire add 2 more tbsp of coconut. Mix and serve. I'm a bong girl living in Chile for 20 yrs now. Getting hold of stuffs like shapla and kochur loti are impossible. However reading your post's sending me through those sweet memory lanes and making my tongue salivating, so my question is.....is it possible to try this recipe with asparagus or is it not going to work out? Try it Anumita, It might work though am not sure if the asparagus will disintegrate in the same manner but when cooked with very tender ones it might become very tasty. 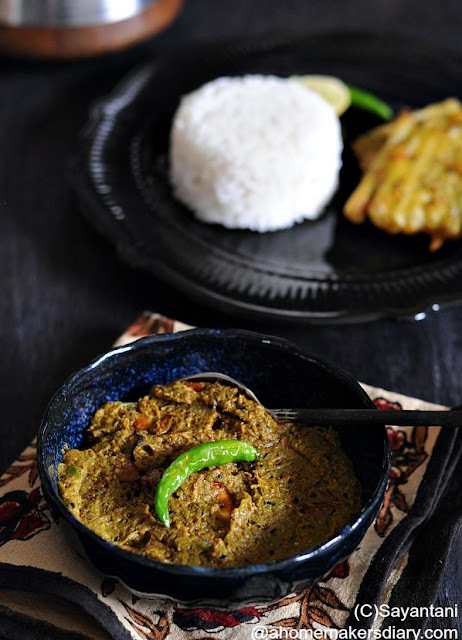 you can make the Shaplar bhyala with asparagus though which I think will be very good. Between check with any Bangladeshi store in your country, They generally sell frozen kochur loti. I used to buy them a lot while we were living in Japan.